Tower is an adult abstraction of a child’s fort. Using both painterly and geometric language, I stack and weave linear elements made from wood, cardboard, and plastic tubing. While the elements are all physically secured to one another, visually they suggest tenuous balance and a childlike delight in improvised stacking. I am able to suggest defiance of gravity in part by making some of the structures out of cardboard that is fashioned into 2"x4”s. The proportion and painted surface makes the cardboard forms blend easily with the wooden ones, and they can be suspended with zip ties or plastic tubing because of their minimal weight. In Tower, what appear to be additional side braces are in fact cardboard attachments that support nothing but the illusion that the tower is unstable. An “island” made of branches and wooden triangles suggests a conglomeration of flotsam and jetsam that has been tethered by brightly colored plastic chain. This chain, as well as an improvised ladder, connotes a castle’s moat. Though suggestive of a fun playground, the structures clearly cannot actually be climbed, creating wistfulness and a sense of longing. 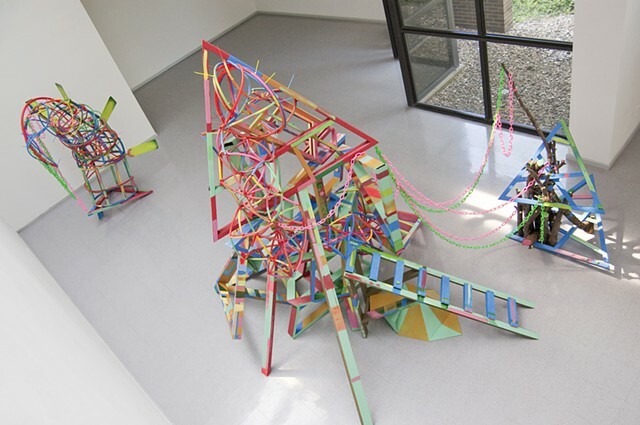 The installation’s improvised forms and playful colors recall not only the optimism of childhood, but also the temporary nature of any child’s creative efforts. From snow forts to structures crafted from fallen tree branches, the architecture of children is inherently temporary. Behind Tower is St. George and the Dragon, a free-standing sculpture that also combines childhood and adult perspectives. Part of an ongoing series of abstractions inspired by iterations of the story of St. George and the Dragon, this sculpture abandons the narrative and composites qualities of the horses, dragons, and princesses pictured in masterworks. The fairy-tale associations pair well with the suggestions of a castle with a moat in Tower. A detailed narrative is unnecessary, as the over-arching content is the individual’s struggle to achieve an ideal state while knowing that nothing is permanent.